The IACC is situated in an area that at first sight seems rather neglected and underdeveloped. Upon further inspection the richness of this neighbourhood comes across. The area has remained whole in spite of, or even because of the lack of activity and development there. The IACC ́s role will be to strengthen and make evident the great potential of the neighbourhood and to showcase the quality of the architecture around it. This is not to romanticise the surroundings or to use the historical references uncritically but to put forth the innate values of the area, either by contrasting it with something “new” or by designing in cohesion with the existing so that the new intervention creates a whole with the context. We examined the neighbourhood looking for a way to understand it and to try and identify what kind of intervention would fit there. We took into consideration the rather decorative style of the Italianate architecture and the vivacious palette of colours. Both are important factors in maintaining the atmosphere of the neighbourhood. Our design is a direct response to this exploration. The idea here is not to create a spectacular “landmark” but something that is more sensitive and a reaction to the status quo. The building needs to be approachable from up close, not only a beacon to be perceived from afar. We intend to bring a new take on the kind of materiality and detail existing in the surroundings in order to resonate with the collective memory of the people in the neighbourhood. The approach from the street already gives to the visitor before they enter – It lends a sense of material quality and value through craftsmanship and a view of the work done inside in the rental studios. The existing building is the main motif in this design. It is the heart and the source of all activities. We identified its main qualities and built around those so that the existing can get a new life retaining its humble identity but acquiring additional value – the existing warehouse gives the tone for the rest of the complex. Functions placed in the existing tie together the entire centre. Here we have the more social activities, organisation and temporary functions. A crucial part of a healthy thriving creative workspace are places where people can spontaneously meet. We have therefore placed a certain importance on areas of gathering or simply staying. The main vein in the centre runs through the existing, so connecting the newer elements. This street is of utmost importance – it is a generous space that can incorporate and represent what is produced in the centre as well as becoming a social hub. On either side of the existing building there are the complementary functions of working and living. The so-called shop floor is on the west side, forming a functional work hall. We prioritise the practicality of this space and its muted exterior serves to complement the rather intricate existing and more refined residential. 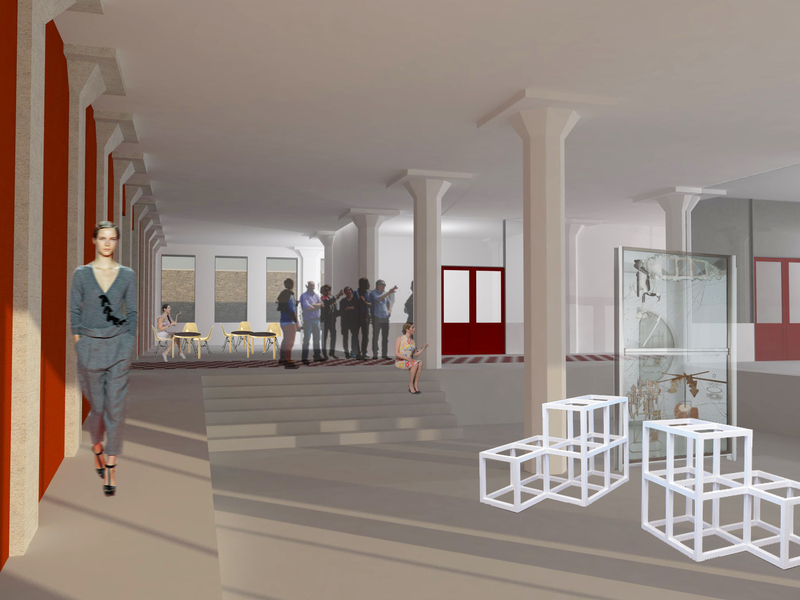 Here work is the driver for all decisions made, at the same time it is a monumental space that could double for large gatherings and can work in combination with the cafe which is situated in the existing building. The residential on the left side is placed on the more social side of the existing warehouse. It strikes up a dialogue with the local church, both is scale and function. The shop-like ateliers on the ground floor serve as workspaces for the living above, but could double as a space for the local community for gatherings, or events. The residential design is a nod to the local architectural heritage, perhaps suggesting new ways of using similarly proportioned existing spaces. 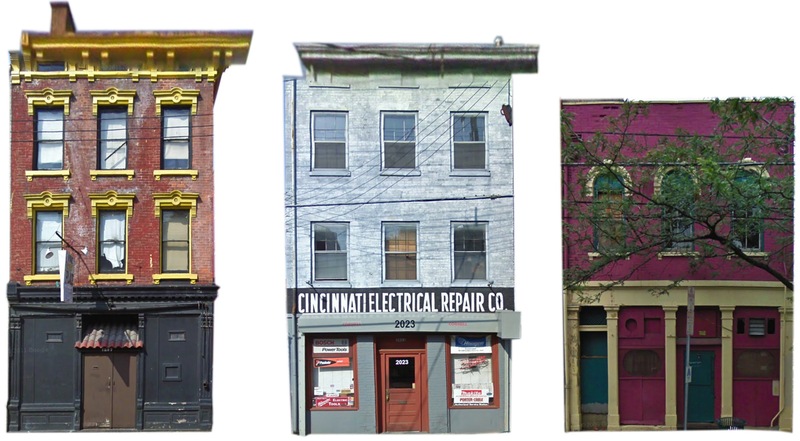 The LIVE-MAKE INDUSTRIAL ARTS CENTRE CINCINNATI, is a step in the re-animation of the Over-the-Rhine area. It is vital that the Centre represents this in its whole being. Any future developments should to be of the place – regeneration from within. We had a lot of fun working together, and now look forward to getting started on our first ‘real’ project at Nyp in Iceland.